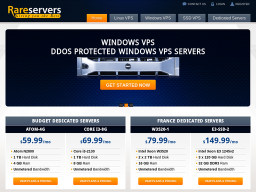 RareServers.com is a world-wide provider of VPS and dedicated web hosting. As a technology and product innovator, RareServers is able to provide their customers innovative products and services designed to complement their existing businesses. RareServers customers are frequently web designers and or developers who have chosen to provide hosting services to their clients. Businesses of all sizes and shapes frequently make use of RareServers's affordable, but still powerful shared, reseller, and dedicated hosting services. Customers range from complete novices to computer and technology experts. In addition to President and RareServers's management team consists of web hosting and technology veterans working together to ensure Rareservers continues to provide the quality web hosting services it has become known for. RareServers Technology was founded in 2014 to provide high performance & secure infrastructure for all type of hosting needs. All I can say about rareservers.com hosting is that it is quite reliable one. It is great and good web hosting provider. Thank to this web site I was able to created so nice web pages. It's very easy to use it and add pages, photos, articles... The servers are fast. I was put on a shared server with lots of load. I ask them if they would move my account to another server and they did it. You wan to see how fast their servers are? Just sign up and see how fast you get FTP and admin credentials sent to you. It's almost instantly. As a first time user of a VPS, I would have to give lots of thanks and support to the rareservers team. They provided me with very helpful solutions and answers to all of my questions for a first time user. Now I have so much more control of my web server and confidence being supported by this reliable company. Additionally, I did not purchase the cPanel. With my general knowledge of Linux and help from the support team, I was able to install only what I wanted to meet my PCI compliance. Overall, I would recommend Rareservers.com service!